The one way force deck is one of my favorite trick decks! And that’s true. It is a really obvious trick deck and can ruin the credibility of a trick if you use it wrong. If you use it right, it can produce some JAW-DROPPING magic. First of all, what’s a one way force deck? It is a deck of 52 cards where every single card is exactly the same. 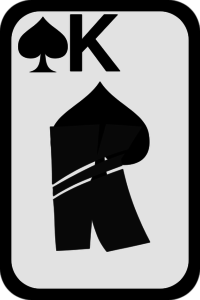 For example, a deck full of the Queen of Spades, or full of Jack of Hearts. It’s really as simple as that (no further explanation is required). The reason we call it a ‘force’ deck is for this very reason. Imagine you had 52 Queen of Hearts in the deck, and you asked a friend to pick a card. What card would they pick? The Queen of Hearts, of course! If you’re worried about being busted using this deck, maybe you should change tack. Instead of presenting it as a magic trick, use it as a joke deck. What do I mean by this? For example, get your friend to pick a card. Let’s say you have all King of Spades in the deck. As he picks his card, casually say ‘pick any card in the deck…as long as it’s NOT the King of Spades’. This time, he’ll be impressed. Your audience will have know clocked on to the fact that this is part of a trick. They might even be impressed by your apparent sleight of hand skills. Repeat this little sequence a third time to really blow them away! Now, as they start to get frustrated with not knowing how it’s done, flip all the cards over to reveal that every card is exactly the same! This is a fun gag to wind people up with and relieve some of the tension sometimes created by magic tricks. If you’re into magic, the chances are that you’ve heard of a ‘Any Card At Any Number’ routine before (ACAAN). 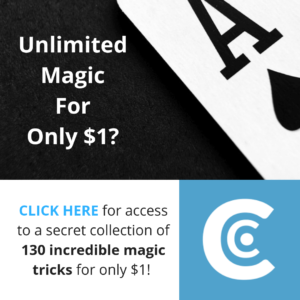 This trick is often considered the ‘holy grail’ of magic and can absolutely wow audiences. The magician asks one spectator to pick ANY number between 1 and 52. He then asks another spectator to pick ANY card in the deck. The named card is found at the EXACT number that was freely chosen by the audience. How cool is that, right? Well, a one way deck can certainly help this trick out. For example, check out this awesome ACAAN performed by Derren Brown himself. Now, I’m not saying he DEFINITELY uses the one way deck, but that is 100% a possible method. Notice how he displayed different cards up to a certain point, and then stopped? 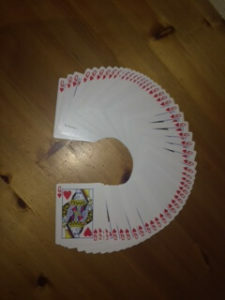 I imagine around 3/4 of the deck was all the same card, and he chose to display the remaining quarter to assure the audience that every card was different. So, if you’re looking to learn an ACAAN routine, a one way deck can certainly help you out with the card selection part of the trick. If you know an actual card force, you’re all set for a great trick. The magician invites someone up to pick a card. He displays all of the cards to show that they’re different. The magician puts the deck down and closes his eyes. Incredibly, he is able to read the mind of his spectator to reveal that the chosen card is the Three of Hearts. But the trick isn’t done yet! 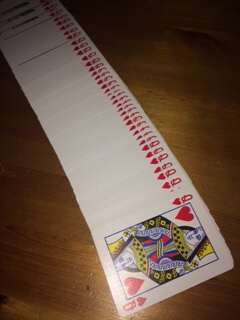 The magician pulls a second deck of cards from his pocket- still inside the box. He opens the box and slowly spreads through the cards. 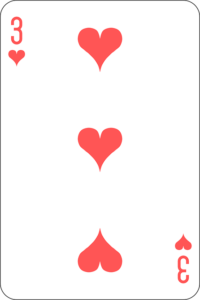 Every single one of the cards inside the deck are also the Three of Hearts- the spectator’s selected card! This is a really easy trick but looks great. First, you need to learn a card force. There are tons of videos on YouTube that can teach you this. Once you have a card force that you feel comfortable doing, you’re pretty much all set up and ready to go. Obviously, the card you’re going to force on your spectator will be the card that makes up your one way deck. If you’ve got your one way deck in your pocket and a regular deck of playing cards in your hand, it’s time to do the trick! There’s really nothing to it. Just ask a friend or family member to pick any card, do your force and then it’s all just a matter of performance (all the hard work is completely done). Remember, there’s two phases to this reveal. First, you ‘read their mind’ to guess the card, and then comes the ‘kicker’ ending of the extra deck that is full of their card. Well, consider the previous trick. You forced a card and then revealed that you had a deck that was full of that card. Cool, but now WOW! For example, you could try mixing it up and revealing the second deck in a different way. Maybe you ask the spectator to hold the deck before you begin the trick, so they have it in their hand the entire time! Or you scatter the cards around to different locations and reveal them one by one! There really is no limit to how creative you can get with this trick so be sure to try and vary things up. Leave a comment if you have any cool ideas! So there you have it! 4 cool ways of using your one way force deck. This trick deck might seem obvious, but don’t underestimate what you can accomplish with it! It’s one of my top trick decks of all time, up there with the awesome Invisible Deck. I really like your magic. I reviewed some of the other posts and will follow you on twitter. I can’t even shuffle a deck of cards well but I love watching someone else handle them. Your magic tricks are entertaining and fascinating and I’ll be looking forward to more. Wow, that’s a cool trick! And explains some of the magic I’ve seen in the performances. Anyone hosting a party can learn some of your tutorials and become a favorite entertainer. Awesome, keep us posted on how it goes for him! Thank you. I bought Derren Browns Trick of the Mind Book and read cover to cover. I learned to hypnotize people in only a few pages. Its really easy. I also learned a few tricks and magic in general just fascinates me. I never heard of the one way force deck, as I am only a beginner – maybe for life – and so I will remember to buy such a deck of cards. I know that trick would go down a storm in front of a few friends. 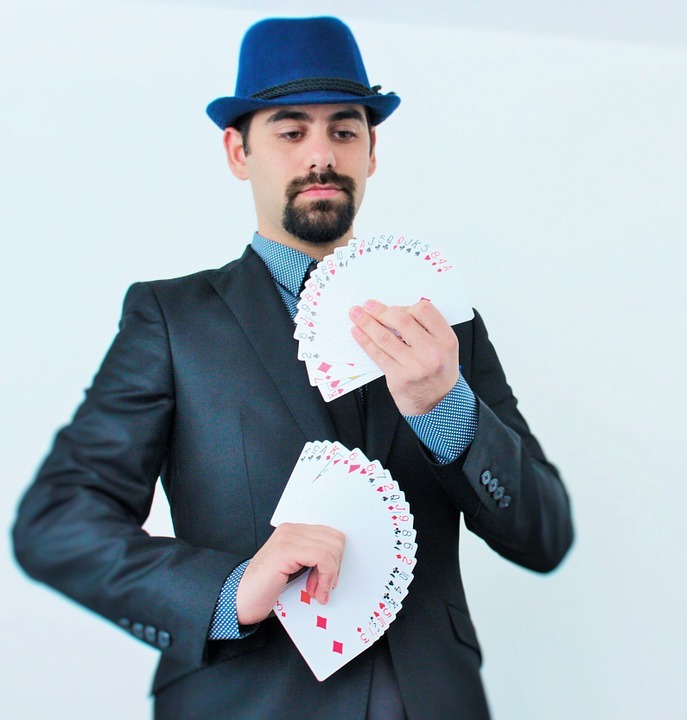 Great article and I learned another trick with my own deck of cards. Thank you. Derren Brown is a great performer. If you’re interested in learning how to do tricks like him, I did recently put together a guide to learning free mentalism! The one way force deck is a great trick, I’m sure it will! Hi Benji, love the niche my friend; you really have a great grasp on this. These tricks are impressive. I will look into them in greater detail for sure! Thanks!